VW builds the Polo sedan in Kaluga, along with Audi and Skoda models. FRANKFURT -- Volkswagen Group's core VW brand reversed heavy losses in Russia, Europe's most promising growth market, in the first half, helped by rising market volumes and a recovering currency. Russia has long been tipped to become the largest single market in Europe, eclipsing Germany’s 3.35 million new vehicles registered last year. Sanctions stemming from the Ukraine conflict over separatist ethnic Russians combined with a sharp drop in revenue from oil exports drove a 11 percent contraction in the market last year to just 1.43 million cars. "We were able to break even in Russia in the first half, with a little bit of help from the ruble,” said the brand's finance chief Arno Antlitz during a conference call on VW brand's second-quarter results. Admitting that the brand got "lucky" when it came to factors outside of its control such as the currency, Antlitz said VW had followed an approach it is applying to all loss-making regions in terms of efficiency gains, fresh product momentum and polishing its image. "How that works out we can see in Russia, where we really reduced costs in the past months and years. We introduced the new Tiguan and our brand positioning is also improving," he said. Although the market conditions are quite different between the three regions, Antlitz said VW was also following this pattern when it came to its turnaround plans for the U.S. and South America. A return to profitability in Russia, North America and South America is part of the brand's strategy to achieve a 4 percent operating margin by 2020. In order to bypass import duties, VW Group has invested into Russia to meet local content requirements. In total it has invested 1.75 billion euros in the country, where it has a factory in Kaluga, 170km southwest of Moscow. 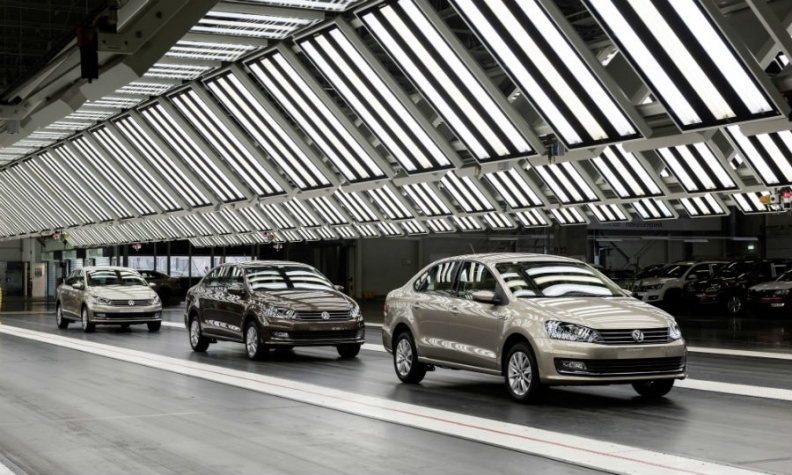 The plant builds VW, Audi and Skoda models. In June, VW extended a deal until 2025 with Russia's GAZ group to produce VW and Skoda brand vehicles at GAZ's Gorky plant. The considerable investments have failed to pay off however with high volumes. VW brand's vehicle sales in Russia were less than 1.4 percent of its global volumes in the first half. Much of that has to do with a general collapse in demand as plunging prices for its oil exports and a plummeting ruble together drained the economy of consumer purchasing power in recent years. That is slowly starting to change, according to Marcus Osegowitsch, head of Volkswagen's Russian business. "The ruble is stronger again and we are managing. If it stays somewhere between 65 and 67 to the euro, this is fine for us," he said in March. The market appears to have finally bottomed out. VW brand's new-car sales in Russia increased by 19 percent through July to 46,866, more than twice the rate of the market's 9 percent growth, data from the Association of European Businesses in Russia showed. The brand's market share jumped 4 percentage points to 5.5 percent. The association expects the Russian market to grow by 4 percent this year. During a conference call earlier this month, Ford Motor CFO Bob Shanks said he, too, was excited about the return of the market. "We believe [Russia] has the opportunity to first grow, to potentially be the largest individual market within Europe, but also to give us very good returns."